Written by Ramya Gopal and Aparna Ananthasubramaniam on April 6, 2018 . What roles do people with DACA often play in their families? What impact does DACA have on their families? So we asked DACA clients: “In the past 6 months, have you supported your family financially or helped them access resources in any of the following ways?” We provided nine options and an invitation to select all that applied. We received 431 responses clients, including one that indicated the respondent did not help support their family. Nearly all of DACA recipients said they were helping their family financially or get access resources. The most common type of support? 74% contribute to household bills and other regular monthly expenses. Among many other sources of financial support, DACA recipients often also supported their family in non-financial ways. For example, 44% of respondents said they drove family members who don’t have a driver’s license. As you can see below, DACA recipients described in their own words how much their families relied on them – for finances, transportation and more. We heard from recipients that DACA allowed them to access resources to support other members of their family and network. That in fact, DACA has a multiplicative effect: providing one person with protections and work permits impacts everyone they support financially and otherwise. This research shows us that there’s a very powerful social and familial network effect with DACA. When we research the effect a government program or immigration status has on one person, we also must think about the family. Especially when so many of our families are mixed status, better governmental protection and even an intermediate status like DACA can have a very positive effects on entire family networks. 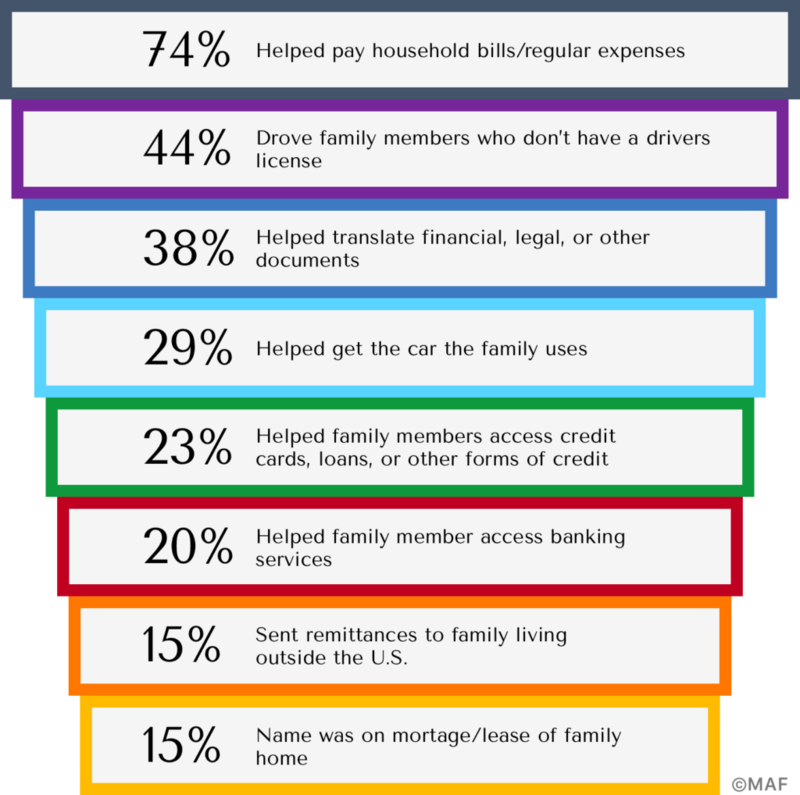 At MAF, this is leading us to think more about how we can support families in growing their collective financial wellness. Because engaging and leveraging your social network is an important and viable strategy for managing financial lives.